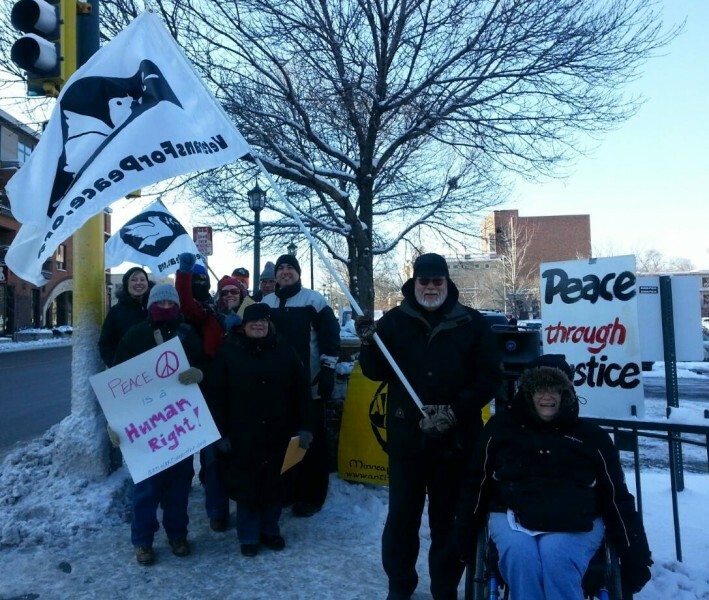 Minneapolis protest marks Human Rights Day | Fight Back! Minneapolis, MN - 40 protesters gathered to mark International Human Rights Day at the corner of Franklin and Nicollet Avenues, Dec. 7. After a few rounds of chanting, the rally opened with a speech by Sabry Wazwaz, who spoke about the Palestinian struggle for liberation, the right of return and basic human rights. He noted that Israel is an enemy of peace and human rights, supported by billions of dollars in U.S. aid. 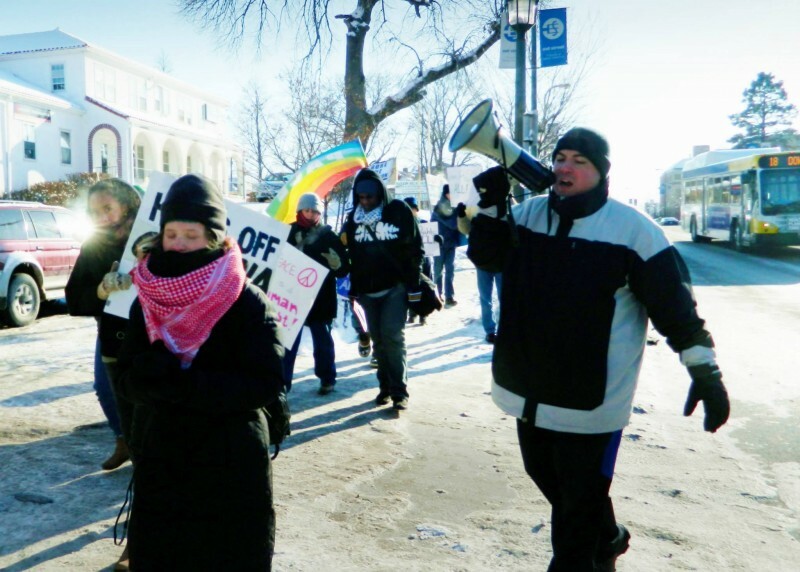 Although the temperature dipped below zero, spirits ran high as the group set off for a march along busy Nicollet Avenue. Passersby gladly took flyers, cars honked and protesters raised chants of, “Human rights are under attack! What do we do? Stand up, fight back!” and “Stop the wars, feed the poor, human rights for all!” The protest called for an end to U.S. militarism and warfare from Afghanistan, throughout the Middle East and to Colombia; demanded money for human needs not for war and called for an end to political repression. The march ended at The Nicollet coffee shop, where Anti-War Committee member and poet Misty Rowan opened a program for a crowded room of protesters and regular café-goers. Speakers included Anh Pham, of the Committee to Stop FBI Repression, who called for support for Palestinian Rasmea Odeh; Angel Buechner, Welfare Rights Committee; Steve McKeown, Veterans for Peace, chapter 27 and Eden Yosief, an SEIU member recently returned from a labor solidarity delegation to Colombia. To close the program, two fourth graders, Leila and Cocoa, along with Steph Taylor of University of Minnesota Students for a Democratic Society, sang the civil rights movement song, Get on Board, inviting all present to join them. The protest was endorsed by Mayday Books, the MN Immigrant Rights Action Committee, MN Peace Action Coalition, Students for a Democratic Society-U of MN, the Twin Cities Peace Campaign, Veterans for Peace, the Welfare Rights Committee and Women Against Military Madness.